The aim of this study was to assess the quality of source water used for domestic purposes in the town of Karoi. The objectives were: to determine the quality of surface water in the study area; and to characterize point and non-point sources of pollution. The study examined physical and chemical surface water quality parameters that may indicate pollution and so help to identify surface water pollution. The results showed that most of the measured parameters in surface water examined in Karoi were within the acceptable range of WHO drinking water guidelines. When compared with the guidelines, electrical conductivity was slightly higher; turbidity and total suspended solids were significantly higher in the wet season than in the dry season due to water flowing, which carries particles with it; and the changing seasons resulted in slight changes in surface water temperature. The results suggest that some human activities, like agriculture and poor sewage disposal in Karoi, can reduce surface water quality in Karoi. Water sources for drinking and other domestic purposes must possess high degrees of purity, free from chemical contamination and microorganisms (Chinhanga 2010). In Zimbabwe, government authorities are concerned about water quality and they have set up organisations like ZINWA (Zimbabwe National Water Authority) to oversee policy applications for the observance of water quality standards. The rapid growth of urban areas has further affected the quality of surface water due to overexploitation of the resource and improper waste disposal practices (Barat 2012). Major urban rivers in Zimbabwe show high levels of pollution (Nhapi 2009). The major concern is the quality of water in the tributaries that feed into major rivers, especially those tributaries that meander through towns and cities. Sewage and industrial waste inflow characterize the urban environment. This situation is aggravated by backyard industries and poor agricultural practices (Moyo et al. 2004). A study of sources of pollution by Dlamini et al. (n.d.) shows the threat and the extent of the harm befalling rivers in Zimbabwe. The inflow of pollutants and particularly nutrients into a river system modify the nutrient status of a water body. Chinhanga (2010) found that the visible effects of nutrient enrichment are algae blooms, the massive growth and proliferation of microscopic and macroscopic plants. The weeds, which are a problem to water resources management in Zimbabwe, are water hyacinth; pennywort, parrot’s feather and Kariba weed (Moyo et al. 2004). The aquatic environment is the ultimate sink of wastewater generated by humans’ industrial, commercial and domestic activities. Nearly 800 ML/d untreated wastewater finds its way into rivers and lakes (Harris et al. 1999). Population growth and the resultant human activities in the period 2009–2011 have resulted in increased wastewater generation in Karoi and have had a negative impact for the town on the surface water quality (Chinhanga 2010). According to Dlamini et al. (n.d.) Karoi has become industrialised and its population is growing at a rate of >500 people/y. This situation, although improving the livelihood of the people, has impacted negatively on water resources. Population growth has led to the overloading of sewage treatment plants which could not be expanded to cater for the increase (Nhapi 2009). Consequently the effluent quality being discharged has deteriorated (Nhapi 2009). Barat (2012) noted that with the ever-increasing rates of unemployment, most residents in major towns have resorted to backyard industry, where their wastewater is difficult to monitor, and this has resulted in significant impacts on the surface water pollution in these towns. As Karoi, Petergroot, Jimmy, K14 and Black reservoirs are the sole sources of drinking water for 650 000 people (Department of Water Resources 2012) there is a need to determine the quality and impact of wastewater which finds its way into them, through testing of the water quality. Karoi Water Treatment Plant opened in 1989 with a maximum design flow capacity of 350 m3/h, with aluminium sulphate and lime dosing, two flocculation tanks, three rapid sand filters and chlorine gas chlorination (Benham 2009). While provision was made for the plant to double its capacity when demand required it, expansion of the system was not a priority during the 2011–2012 period when this research was conducted. During the research period, there was no detailed documentation of the supply of water available and there was a disparity between the position of the Karoi Town Council (KTC), that all urban areas had access to water when water was available, and the position of GOAL Zimbabwe, that certain areas have not received water ever (Benham 2009). Clearly, in 2009 the WTP was not functioning properly, and even today it is not functioning properly, and was unable to supply enough water to the residents of Karoi. Thus, people relied on source water for other uses while they got potable water from boreholes. As 650 000 people were at risk from drinking the polluted water (Chinhanga 2010), a study was needed to determine the quality of source water in the reservoirs. Karoi is located in the western part of Mashonaland West province. It is bounded by the Angwa River to the southeast, the Piriviri River to the south, the Sanyati River to the west and the Zambezi River to the north. The main geological formations occurring in the area are the greenstone belts of the Bulawayan and Shamvaian group (Nhapi 2009). Granite rocks are more abundant than any other rock type. They are varied in age and range from the older gneissic rock to younger intrusive granites. Young intrusive granites stretch from Mutorashanga to Raffingora, west of the Great Dyke and from the Muneni river through Trelawney up to the Manyame river (ZINWA 2011). The older gneiss complex rocks form the bulk of the lithology within Karoi. Such kinds of rocks are hydrogeologically inhomogeneous and this makes it difficult to rely on ground water recharge (Gavio et al. 2010). Groundwater potential is poor hence the town depends on surface water storage (ZINWA 2011). Annual rainfall is confined to the summer. Dry spells during summer are limited. Karoi is therefore characterized by hot, wet summers and cold, dry winters of <19 °C (Moyo et al. 2004). In summer, the average diurnal temperature is ~30 °C, whilst in winter it is <19 °C. Karoi is both a town and a district in Mashonaland West province. Karoi town is located approximately 200 km northwest of Harare along the main road from Harare to Kariba and Chirundu (see Figure 1). The population of Karoi town in the 2012 census was 18 757 (Zimstat 2012) but Karoi Town Council (KTC) estimates the current population is 29 000 in the three urban locations known as town and the two high density areas of Chikangwe and Chiedza, with another 11 000 people within the administrative rural area of 10 km radius around the town (KTC 2012). Karoi is also ~80 km northwest of Chinhoyi, the capital of Mashonaland West province. Until the year 2000 KTC was buying water in bulk from the water treatment plant operated by ZINWA for the single urban area of Chikangwe (Benham 2009). ZINWA took over revenue collection in this area from this time, as well as continuing to collect revenues from the low density and commercial areas. Subsequently, in accordance with the Karoi Town Development Plan a new housing area was developed called Chiedza. KTC is developing the administrative infrastructure to have Karoi declared a municipality. From February 2009, government edict allowed for control of the water and sanitation services to be returned to KTC provided they could demonstrate they had the capacity to manage the system (Benham 2009). This transfer has not taken place (at the time of writing, the end of 2016-12); ZINWA offered the control of the wage systems to KTC but wished to retain control of the operation and revenues associated with the water system. Figure 1 Map of the study areas. Sampling was conducted fortnightly from 2011-07-02 to 2012-02-24. This period is representative of the dry season (2011-07 to 2011-10) and the wet season (2011-11 to 2012-02). Sampling was done at the same time on each sampling day (10:00 h to10:30 h). The sampling sites were selected on the basis of safety, accessibility, and how representative they were of the study area. Water was sampled from 6 reservoir dams, namely Karoi, Petergroot, Jimmy, Black, Hurst and K14. These sites (see the map of the study area, Figure 1 above) are shown in Table 1 with their distances from the Karoi WTP which was not and is not functioning properly to date (end of 2016-12). Table 1 Sampling site, distance, sampling type and frequency of sampling. Table 1 shows the sampling sites. Jimmy dam is along the Mushowe River, which is tributary to the Piriviri River. The site is to the northwest of the study area and is 3.9 km from Karoi WTP. The dam is downstream of Mushowe. This site represents areas with dump sites. Black dam is also along the Mushowe River. This site is on the upper course of the Mushowe. The site also represents areas high in dump sites as well as areas of tobacco cultivation during the rainy season. As part of improving the quality of tobacco in this area, the fields are fertilized in January or February each year. Tobacco fields can contribute to the pollution of dams (via rivers passing through them) due to frequent fertilizer application, which rainwater washes off as excess nutrients in runoff, thereby increasing nutrient loads in the rivers and thus into the reservoirs. Petergroot, Karoi, K14 and Hurst are all along the Karoi River, which is a tributary of the Angwa River. Petergroot dam is 3.8 km from the WTP and Karoi dam is 1.5 km away from the WTP. Hurst dam is 6 km away from the WTP. Karoi River passes through residential areas in Chikangwe and Chiedza. At these sampling points (Karoi dam, Chiedza dam, K14 dam and Hurst dam), the river would have collected runoff and debris from Chiedza, Chikangwe and Mashandudze townships and would reflect the pollution impacts of these townships. The last step in the sampling protocol was to measure the electrical conductivity, dissolved oxygen and temperature. These water parameters were measured in the field immediately after sample collection because they tend to change quickly (Bate et al. 2004). The electrical conductivity and the dissolved oxygen of the reservoirs were measured with a YSI-30 salinity conductivity meter and a YSI-95 DO meter respectively. Both meters provided a temperature reading. The probes of each device were placed in the reservoir water at the dam at approximately half of the total depth. The probes were placed in undisturbed reservoir water. The devices were placed 2 m upstream of where the sample water was collected. Measurements of these parameters were recorded once readings were obtained (see Table 2). Table 2 Water quality measurement instruments. This was measured using a Hach Model 2100N laboratory turbidimeter. Sampled water from each site was poured into a clean, oiled turbidity vial after the sample bottle had been inverted several times. The turbidity vial was filled to the white line, inverted several times and placed into the turbidimeter. A measurement was obtained by waiting for 20 s, watching the digital readout on the turbidimeter and determining an average reading. Two replicate measurements were recorded for each sample. The pH of the sampled water was measured using two methods. First the pH of sample water was measured with a Fisher Scientific AB15 pH meter. Sample water was poured into a small, clean beaker from a 500 ml sample bottle after inverting the sample bottle several times. The pH meter was calibrated before use with 4 pH, 7 pH and 10 pH buffers. The pH probe was then placed in the sample and the values were read from the digital readout of the calibrated pH meter. Secondly, the pH of the water was determined using litmus paper. The litmus paper was dipped halfway into the bottle of sample water. Colour changes were recorded. Comparison to the colour chart was then made and recorded. Total suspended solids (TSS) were measured using a Chemtrac System PC2400 Ps particle counter with Grabbit 311 software. The software was set up to purge with 25 mL of the sample and then count particles in two subsequent 50 mL volumes of the sample. The particle size interval that the counter was set up to measure were 2µm to 3 µm, 3µm to 4 µm, 4µm to 5 µm, …, 75 µm to 100 µm. Sample water from all the sampling points (dams) was run through the instrument in between samples to ensure no carryover. The total suspended solids were measured by first testing the port between the computer and the TSS particle counter. The software settings were then downloaded to the particle counter from the computer. Next, the flow rate of the particle counter was adjusted to 100 mL/min. This was done by using a graduated cylinder and a stopwatch to which the flow rate was adjusted as needed. The surface water quality parameters measured over 8 months at 6 sampling stations include turbidity, dissolved oxygen, total suspended solids, pH, temperature and electrical conductivity. This section presents the results of surface water quality parameters at each of the six sampling stations. Table 3 shows descriptive statistics for turbidity for the 6 stations as recorded from 2011-07-02 to 2012-02-24. The highest turbidity range was recorded at Black dam (9.0 NTU) and the least turbidity range was recorded at Karoi dam (3 NTU). The highest mean turbidity was recorded at Karoi dam (12.65 NTU) and the least mean turbidity was recorded at Jimmy dam (2.4 NTU). Black dam had the highest standard deviation (6.88 NTU) and Karoi dam had the least standard deviation (0.81 NTU). The least variance in turbidity was recorded at Black dam (0.65) and the highest was recorded at Black dam (14.25). Table 3 Water quality descriptive statistics for turbidity (NTU) across six sampling stations in Karoi. Table 4 shows dissolved oxygen (DO) descriptive statistics as recorded from 2011-07-02 to 2012-02-24. The highest DO range was recorded at Karoi dam (9.10 mg/L) at a standard error of (0.60 mg/L) and the least was recorded at Jimmy dam (6.00mg/L) at a standard error of 0.95 mg/L. The highest mean DO oxygen was recorded at Jimmy dam (9.67mg/L) with a standard error of 0.95 mg/L. and the least mean was recorded at Karoi dam (4.94 mg/L) at a standard error of 0.60 mg/L. DO standard deviation was highest at Jimmy dam (4.03 mg/L) while Petergroot had the least DO standard deviation of 2.35 mg/L with a standard error of 0.56 mg/L. Table 4 Water quality descriptive statistics for dissolved oxygen (mg/L) across the six sampling stations in Karoi. Table 5 shows descriptive statistic for temperature recorded at the 6 sampling stations from 2011-07-02 to 2012-02-24. The table shows that the highest temperature range was recorded at Black dam (8 °C) with a standard error of 0.69 °C and the least temperature range was recorded at Petergroot dam (4 °C) at a standard error of 0.21 °C. The highest mean temperature in the study area was recorded at Black dam (20.3 °C) and the least was recorded at K14 dam (18.6 °C) with a standard error of 0.32 °C. The standard deviation was highest at Black dam (2.9 °C) and least at Petergroot (0.88 °C) with standard errors of 0.69 °C and 0.21 °C respectively. Table 5 Descriptive statistics for temperature (°C) at the six sampling stations in Karoi. Table 6 shows descriptive statistics for pH recorded for the 6 sampling stations from 2011-07-02 to 2012-02-24. The highest pH range was recorded at Karoi dam (≤2.7) at a standard error <0.17 and the least was recorded at Jimmy dam (range <0.8). The highest average water pH for the study area was recorded at Jimmy (<7.74) with standard error <0.07. Table 6 Descriptive statistics for pH at the six sampling stations in Karoi. Table 7 shows descriptive statistics for electrical conductivity recorded from 2011-07-02 to 2012-02-24 at 6 sampling stations in Karoi town. The highest standard deviation in electrical conductivity as recorded was at Karoi dam (<24.83 S/m) and the least standard deviation were for data recorded at Black dam (<19.23 S/m). The greatest mean electrical conductivity value was recorded at Black reservoir (<139.7 S/m) and the highest range was recorded at Hurst (≤87 S/m). There was no normalisation of the electrical conductivity readings to a particular temperature value; we used the raw data without any temperature adjustment. Table 7 Descriptive statistics for electrical conductivity (S/m) at the six sampling stations in Karoi. Table 8 shows descriptive statistics for total suspended solids recorded from 2011-07-02 to 2012-02-24 at 6 sampling stations in Karoi. The highest mean total suspended solids were recorded at the Hurst dam (132.9 mg/L) and the least variance in total suspended solids was at Jimmy dam (<9.04). Table 8 Descriptive statistics for total suspended solids (mg/L) at the six sampling stations in Karoi. The results showed that turbidity tended to be lower during the dry season and higher during the wet season. This was in agreement with what Bate et al. (2004) had observed: that turbidity tends to be lower during the dry season and higher during the wet season. Rivers also tend to be turbid during the rainy season due to increased eroding power (Bain et al. 2012). However, the results of this study disagree with this at the Jimmy reservoir as there was a significantly higher turbidity in the dry season and significantly lower turbidity in the wet season. The release of domestic sewage into rivers can increase turbidity levels and TSS concentrations in a river (Owili 2003). The results agreed with the assertion that the release of domestic sewage into rivers can increase turbidity levels and TSS. Not only does turbidity increase due to sewage disposal into the rivers but it also increases due to cultivation around a water body and the dumping of solid waste near water bodies. Site 4 (K14 reservoir) had the highest turbidity despite being far away from residential areas where there were high chances of waste disposal into rivers. High turbidity in K14 reservoir was probably due to there being cultivation near water bodies. Turbidity normally increases during the rainy season for most South African rivers (Palmer et al. 2004) and this might be true of Zimbabwean rivers since there was an increased turbidity level in all the sampling sites in the Karoi sub-catchment area. Human activities like cultivation, road and bridge construction can result in increased levels of turbidity (Shrestha et al. 2008). This could have caused the high turbidity and TSS levels in K14, Jimmy and Black reservoirs in the wet season since cultivation and road maintenance were taking place at these sampling sites. Turbidity levels for most of the sampling sites in Karoi were above those recommended by the WHO (2008) for drinking water of 1 NTU (Matowanyika 2010). High turbidity levels reduce light penetration (Jarvie et al. 1998) leading to a decrease in the rate of photosynthesis in aquatic plants (Harris et al. 1999). Cattle grazing and domestic sewage are among the major human sources of organic matter in water bodies. Organic matter from these sources requires oxygen for decomposition and depletes oxygen upon entering surface waters, thereby decreasing dissolved oxygen concentration in that system. Other effects of high organic matter levels in water bodies are increases in turbidity levels and TSS (Delille and Perret 1989). The results of the measurement of dissolved oxygen in Karoi showed that the amount of dissolved oxygen was lower than the required levels for a source of drinking water. According to the ZINWA (2011), the maximum limit of dissolved oxygen in water is 7.5 mg/L. The relationship between the two is that as water temperature increases, the solubility of oxygen within it decreases. DO is of fundamental importance in maintaining aquatic life and is therefore one of the most widely used water quality variables (Tchobanoglous and Schroeder 1985). Factors causing a decrease in DO (hypoxic condition) in rivers include elevated temperatures and salinity and the respiration of aquatic organisms, among others. The highest electrical conductivity was recorded at Hurst dam (<199 S/m), in 2011-12. This was followed by conductivity of <197 S/m recorded at Jimmy dam and Black dam in 2011-12. Generally, the results of this water quality study done in Karoi showed that electrical conductivity was high in 2011-12 at all the sampling stations. The least electrical conductivity (<103 S/m) was recorded in 2011-10 at Karoi dam. Electrical conductivity was generally low in the dry season from 2011-08 to 2011-10 and higher in the wet season, 2011-11 to 2012-02. A high electrical conductivity is a result of inorganic dissolved solids that carry a charge (Bate et al. 2004). This implies that there were a lot of dissolved inorganic solids at Hurst dam. Nhapi (2009) found that the electrical conductivity of surface water is influenced by human activities within the catchment. Conclusions and recommendations are made based on the water quality analysis. This section first presents conclusions based on the water quality in the 6 sampling sites, statistical analysis and surrounding land uses. Lastly, the section provides recommendations for improving current water quality and for future water quality monitoring in Karoi. The results showed that sewage disposal had a significant effect on the water, especially in terms of dissolved oxygen and electrical conductivity levels. This effect was widespread throughout the study area. There was, however, a decrease in both levels further away from the sewer outflow points. Matowanyika (2010) reported high dissolved oxygen and electrical conductivity close to a residential area and a rapid decrease in levels as the distance from residential areas increased in South Africa. The low dissolved oxygen levels observed in the study area could be due to increased biochemical oxygen demand, which requires oxygen to break down organic matter, brought about by the sewage. It is also known that oxygen solubility in water is dependent on temperature and pH (Chen 2007). Oxygen concentration will always be lower when temperatures are higher (Gavio et al. 2010). The recommended turbidity for domestic water use is 1 NTU but a maximum ≤10 NTU can be allowed (ZINWA 2011). The water at the 6 sampling stations had turbidity above the recommended limit of 1 NTU although five of the 6 sampling stations had turbidity below the maximum limit for domestic use. Only one station (Karoi reservoir) had turbidity much higher than the maximum limit for domestic water use. The 6 sampling stations showed that the dissolved oxygen levels were far below the minimum levels required for domestic water use of 7.5 mg/L. Electrical conductivity for the 6 sampling stations was far above the required limit for water meant for domestic use of (<110 S/m) but total suspended solids were within the limit because a maximum of 200 mg/L can be allowed for domestic water use. Therefore the first objective of the study was achieved: the quality of water in the study area was determined through measurement, recording and analysis of the water quality parameters that determine the quality of water. The second objective of the study was to characterise point and non-point sources of water pollution in the study area. The use of septic tanks was common throughout the study area. Septic tanks were mostly used for individual households. Water from septic tanks was generally released to the ground through surface drains and these contributed significantly to water quality deterioration in the study area. The concentration of septic tanks was common in Chiedza and Chikangwe. The number and density of this point source pollution (septic tanks) had caused the deterioration of water quality in the study area. Landfills are a source of non-point pollution associated with urban pollution (Owili 2003). Contamination from landfill around Petergroot and Hurst reservoirs leached into the ground and surface water, adversely affecting water quality in these sampling sites. There were 6 landfills in the study area (four in Petergroot and two in Hurst) that received on average ≥2 t solid waste per week. Unregulated dumping also took place in parts of Chiedza, Chikangwe and the Karoi Central Business District, and these were a cause of non-point source pollution. Another source of water pollution in the study area is agriculture (urban agriculture). Agricultural activities in the study area were highly concentrated around Karoi, Petergroot and Jimmy reservoirs. This study identified both non-point and point source pollution in the study areas. The third objective of the study was to develop a water quality best management plan (BMP) for the study area. Over the years, many groups and agencies have developed methods for controlling diffuse pollution. These methods are called best management practices (Nhapi 2009). Best management practices are measures or practices used to reduce the amount of pollution entering water bodies (Bain et al. 2012). The best management practices which must be adopted in Karoi include infiltration trenches, basins and porous pavements, and the filtering of runoff through the soil layer. These best management practices enable physical and biological removal processes to occur. Infiltration systems have a moderate to high removal efficiency for both particulate and soluble urban pollutants, depending on how much of the annual runoff volume is effectively infiltrated through the soil layer (Nhapi 2009). Another best management practice which must be adopted in Karoi, particularly around Karoi reservoir as well as around Petergroot reservoir, is the construction of extended detention facilities. Extended detention makes it possible to achieve moderate or high rates of removal of most insoluble pollutants that settle relatively easily. Establishing a shallow marsh in the bottom stage of a dry extended pond or using extended detention in combination with a wet pond can also assist in enhancing biological pollutant removal. The water quality parameters that were outside the levels of Water Quality Regulations 2000 (stipulated in the S.I 274) were pH, total suspended solids, and electrical conductivity. Water for drinking must have a pH >5, total suspended solids must be <100 mg/L and electrical conductivity ≤100 S/m (ZINWA 2011). These water quality parameters showed a seasonal difference. The trend in electrical conductivity was that the closer the surface waters were to residential areas, the lower the electrical conductivity levels. Karoi reservoir had the second from the least electrical conductivity levels (<120.9 S/m) while K14 reservoir had the least electrical conductivity. Electrical conductivity showed variations in site as well as with the seasons. Electrical conductivity was the most sensitive water quality by site and thus may be the best parameter for measuring human influence in Karoi. 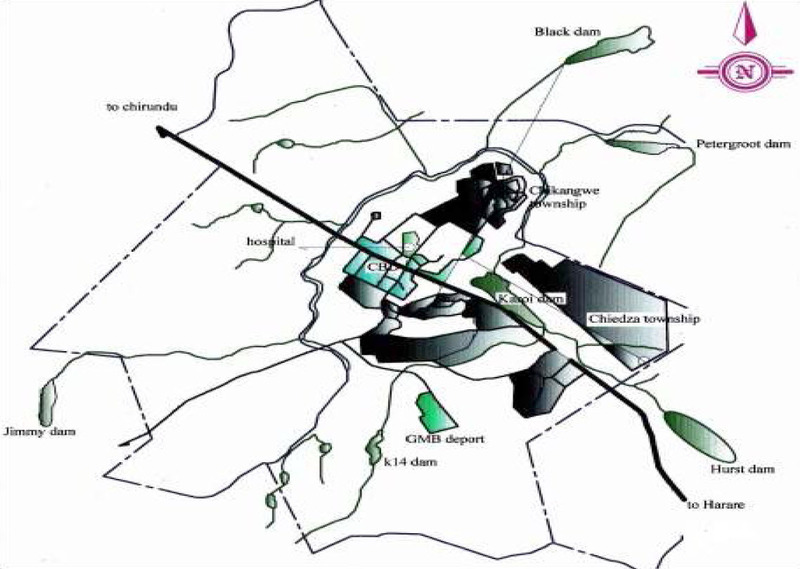 Black reservoir had the highest average electrical conductivity measurement which was 7.6 km away from residential areas, which was heavily influenced by human development and land uses. K14 reservoir, which is furthest from residential areas with little to no human influence, had the lowest average electrical conductivity measurement. Based on the USEPA’s definition, healthy fresh water should have an electrical conductivity benchmark of 110 S/m (Palmer et al. 2004). In terms of electrical conductivity Black reservoir was the most polluted. The electrical conductivity fell above the 110 S/m benchmark at 6 out of 6 sampling stations. The next highest polluted site in terms of electrical conductivity was Petergroot reservoir which fell above the 110 S/m benchmark on average. Electrical conductivity and dissolved oxygen were correlated with temperature. Dissolved oxygen showed an expected inverse correlation to temperature. As temperature increased the saturation levels of dissolved oxygen in water decreased, which yielded an inverse correlation between the two parameters. The correlation between temperature and electrical conductivity may be due to biological processes. Biological processes that affect electrical conductivity (that is, the degradation or organic matter) are affected by temperature and therefore may be the source of the correlation between temperature and electrical conductivity. Turbidity varied by season as well. It was expected that it would vary by season due to high flows during the rainy season, causing erosion, thus increasing turbidity levels. Turbidity was high in the rainy season, but showed no marked fall in the dry season. On average turbidity in the rain season was 12 NTU while the highest average turbidity in the dry season was 7 NTU. The turbidity benchmark of 5 NTU is based on the turbidity requirements to avoid filtration of a surface water source for public water supply (ZINWA 2011). Temperature and dissolved oxygen followed clear seasonal trends. The temperature was slightly higher in the dry season and lower in the wet season. The temperature within the study area ranged from 19 °C in winter (July, August and September) to 20 °C in summer (October, November, December, January and February). The dissolved oxygen concentration was generally inversely related to temperature. This was expected as saturation values of dissolved oxygen decrease with increasing temperature (Barat 2012; Armstrong 1963). There were marked seasonal changes in temperature and dissolved oxygen trends at all the six sampling stations. Pollution from the residential areas (sewage outlets) significantly affected the surface water in Karoi, as dissolved oxygen, electrical conductivity and turbidity were found to be higher at stations closer to residential areas or those which were sources of human waste. The management options available are to repair broken sewerage around Chiedza dam closer to Karoi reservoir. Another management option is to dig a large trench which directs burst out waste water from sewer streams away from the Karoi reservoir (dam) towards the Jimmy reservoir (dam) and away from inhabited areas. For future water quality monitoring in Karoi all the water quality parameters have to be measured over a long period of time so as to get a true picture of water quality in Karoi over a long period of time. The Town Council together with the Environmental Management Agency (EMA) must ensure that urban agriculture around the town is stopped because it reduces water quality in Karoi. All by-laws must be enforced so that the water quality in the town is improved. Until raw sewage no longer flows into the Karoi reservoir from Chiedza dam, drinking water must be drawn from Petergroot reservoir, which is far from residential areas. There must be more boreholes in Chiedza A-D in Karoi as these would supply much clearer and less polluted water to the residents. Karoi Water Treatment Plant, which ceased to operate properly and effectively in 2008, needs to be serviced and maintained as a matter of urgency. Armstrong, F. A. J. 1963. “Determination of Nitrate in Water Ultraviolet Spectrophotometry.” Analytical Chemistry 35 (9): 1292–4. Bain, R. E., S. W. Gundry, J. A. Wright, H. Yang, S. Pedley and J. K. Bartram. 2012. “Accounting for Water Quality in Monitoring Access to Safe Drinking-Water as Part of the Millennium Development Goals: Lessons from Five Countries.” Bulletin of the World Health Organization 90 (3): 228–35. Barat, A. 2012. Phase II MS4 Pilot: Central Massachusetts Stormwater Management. Worcester, MA: Worcester Polytechnic Institute. Doctoral dissertation. Bate, G., P. Smailes and J. Adams. 2004. “A Water Quality Index for Use with Diatoms in the Assessment of Rivers.” Water SA 30 (4): 493–8. Benham C. 2009. Assessment of Karoi Town Water Supply and Sewage Systems. Harare: GOAL Zimbabwe. Chen, B. 2007. Impact of Wastewater to Disinfection Byproduct Formation in Drinking Water. Tempe, AZ: Arizona State University. Doctoral dissertation. Chinhanga, J. R. 2010. “Impact of Industrial Effluent from an Iron and Steel Company on the Physico-Chemical Quality of Kwekwe River Water in Zimbabwe.” International Journal of Engineering, Science and Technology 2 (7): 129–40. https://doi.org/10.4314/ijest.v2i7.63754. Delille, D. and E. Perret. 1989. “Influence of Temperature on the Growth Potential of Southern Polar Marine Bacteria.” Microbial Ecology 18 (2): 117–23. Dlamini, V., Z. Hoko, A. Murwira and C. S. Magagula. n.d. Department of Civil Engineering, University of Zimbabwe Box MP167 Mt Pleasant, Harare, Zimbabwe. Gavio, B., S. Palmer-Cantillo and J. E. Mancera. 2010. “Historical Analysis (2000–2005) of the Coastal Water Quality in San Andrés Island, Seaflower Biosphere Reserve, Caribbean Colombia.” Marine Pollution Bulletin 60 (7): 1018–30. Harris, J., H. R. Van Vliet and H. M. MacKay. 1999. “Water Resource Quality Policy: The Approach Adopted by the Department of Water Affairs and Forestry under the Water Law Principles.” Water Science and Technology 39 (10–11): 31–7. Jarvie, H. P., B. A. Whitton and C. Neal. 1998. “Nitrogen and Phosphorus in East Coast British Rivers: Speciation, Sources and Biological Significance.” Science of the Total Environment 210:79–109. KTC (Karoi Town Council). 2012. Five Year Development Plans in Karoi. Karoi, Zimbabwe: Karoi Town Council. Matowanyika, W. 2010. Impact of Alexandra Township on the Water Quality of the Jukskei River. Johannesburg: University of the Witwatersrand. Doctoral dissertation, Faculty of Science. Moyo, S., J. Wright, J. Ndamba and S. Gundry. 2004. “Realising the Maximum Health Benefits from Water Quality Improvements in the Home: A Case from Zaka District, Zimbabwe”. Physics and Chemistry of the Earth, Parts A/B/C 29 (15): 1295–9. Nhapi, I. 2009. “The Water Situation in Harare, Zimbabwe: A Policy and Management Problem.” Water Policy 11 (2): 221–35. Owili, M. A. 2003. Assessment of Impact of Sewage Effluents on Coastal Water Quality in Hafnarfjordur, Iceland. Mombassa: Kenya Marine and Fisheries Research Institute. Palmer, C. G., R. Berold and W. J. Muller. 2004. Environmental Water Quality in Water Resources Management. Water Research Commission. Shrestha, S., F. Kazama and L. T. Newham. 2008. “A Framework for Estimating Pollutant Export Coefficients from Long-Term In-Stream Water Quality Monitoring Data.” Environmental Modelling & Software 23 (2): 182–94. Tchobanoglous, G. and E. D. Schroeder. 1985. Water Quality. Boston, MA: Addison-Wesley. WHO (World Health Organization). 2008. Guidelines for Drinking Water Quality, Incorporating First and Second Agenda, 3rd ed., vol. 1, Recommendations. Geneva: WHO. Zimstat (Zimbabwe National Statistics Agency). 2012. Zimbabwe Population Census 2012. Harare: Zimstat. ZINWA. 2011. Water Treatment in Zimbabwe, vol. 1. Harare: Zimbabwe.